I have seen the future of lighting, and it is called SuperFlex. 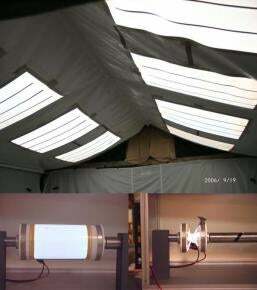 A new, flexible lighting material, the military will start using it in new tents and softwall structures in the near future. It emits light yet is still able to be folded, crushed, or even stabbed and continue pumping out either visible or infrared waves. Easy to transport and durable, these lights are sure to make their way into consumer products such as camping gear in the near future. Sweet.